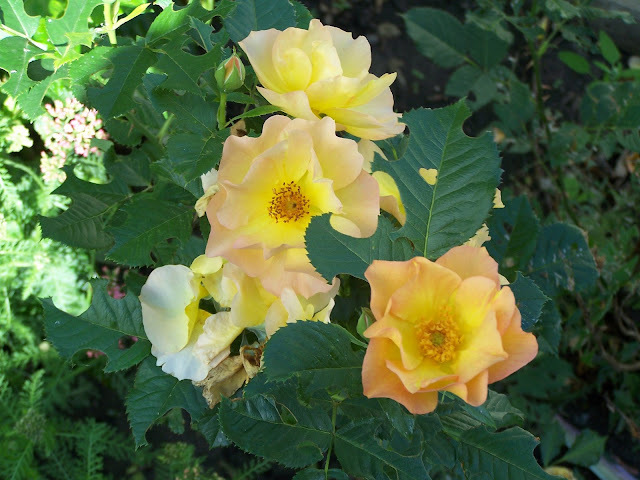 It's Bloomin' Tuesday again, and first up is my Yellow Rose. 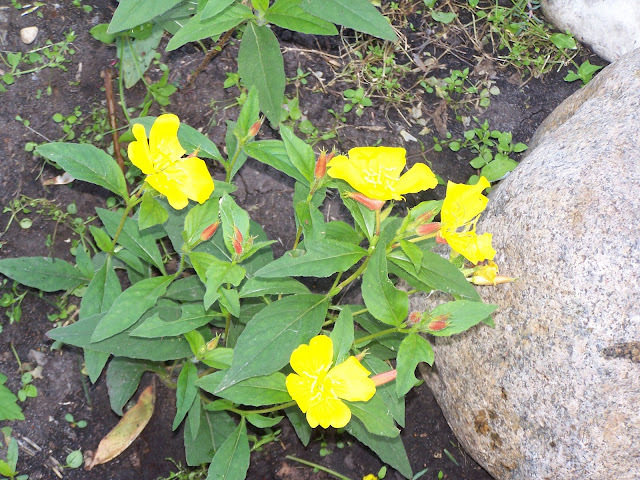 I thought my Evening Primrose had disapeared, but here it finally showed up! 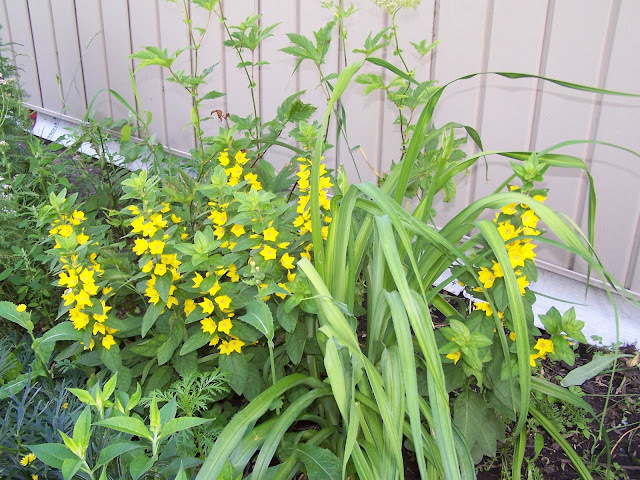 I love delphiniums, but they tend to flop over with a little wind or rain, so I'll have to start staking them. I don't remember the name of this yellow flower, but I love it....I'm partial to yellow! The one drawback to digging truckloads of perennials from my parents' garden, is I don't always have time to get all the proper names! 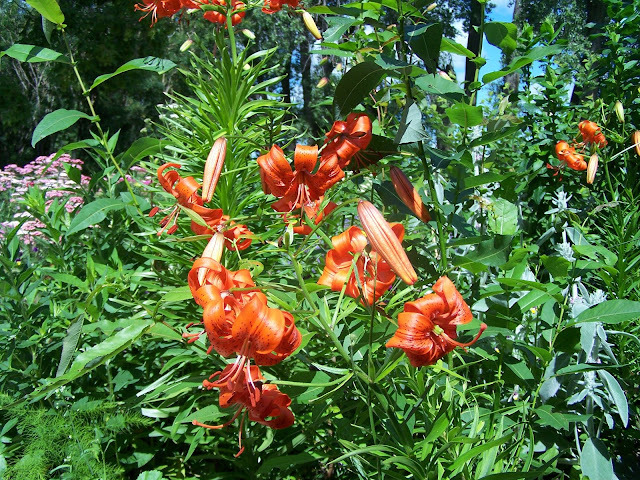 Of course the lilies are blooming. 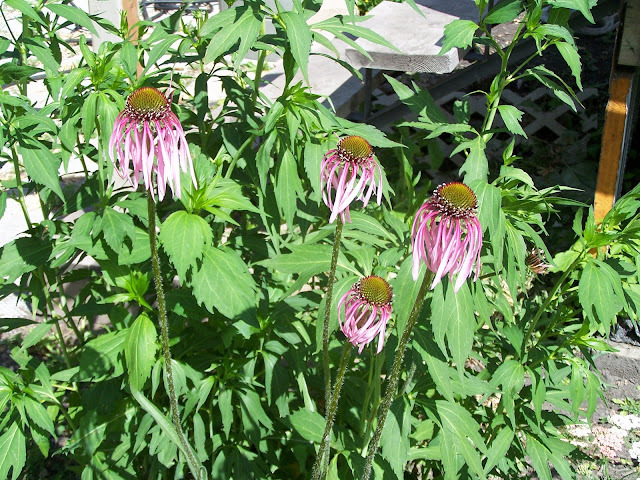 I'm not sure how this Echinacea ended up here...I'm sure I didn't mean to plant it there. One of my favorites, Lavatera. Because I have to cut it back after it blooms, I've planted Yarrow in front, so it won't look so bare, while I wait for new growth. 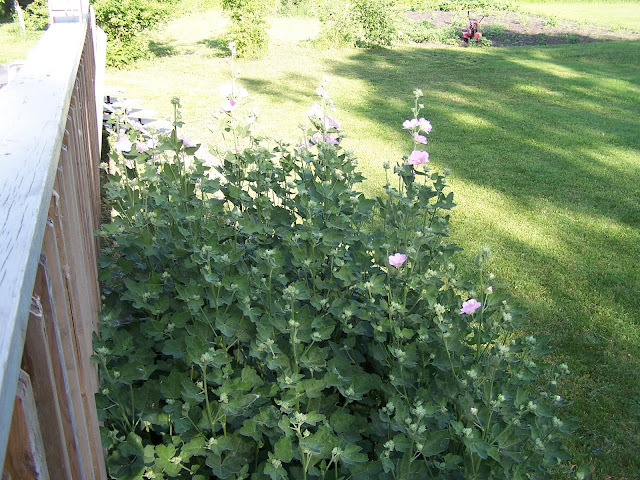 My Lavatera are huge this year, with all the rain we've had. This is taken looking down from my deck. It's just starting to bloom, but is covered in buds. 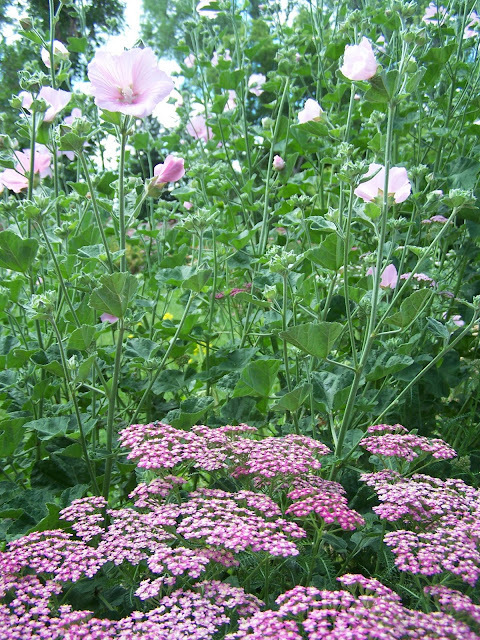 And of course my yarrow hedge is still in full bloom, along with a few other flowers and alot of weeds! 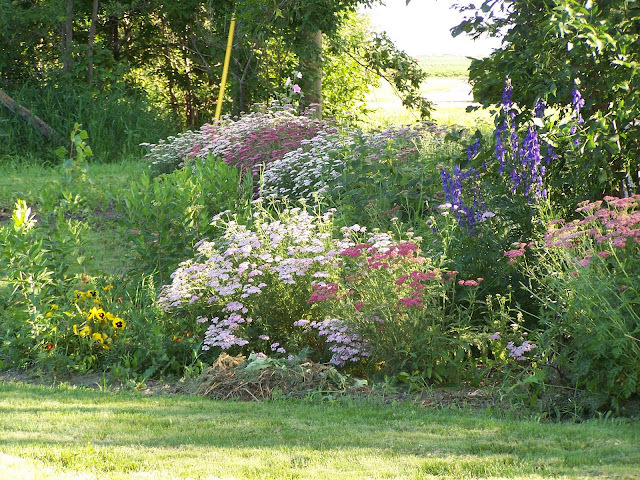 Notice the pile of weeds.....I really have been trying! For more pictures of my yard, scroll down to the next post. 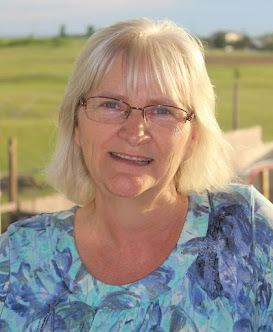 To see some more Bloomin' Tuesday posts, visit Ms Greenthumb Jean. Very nice. 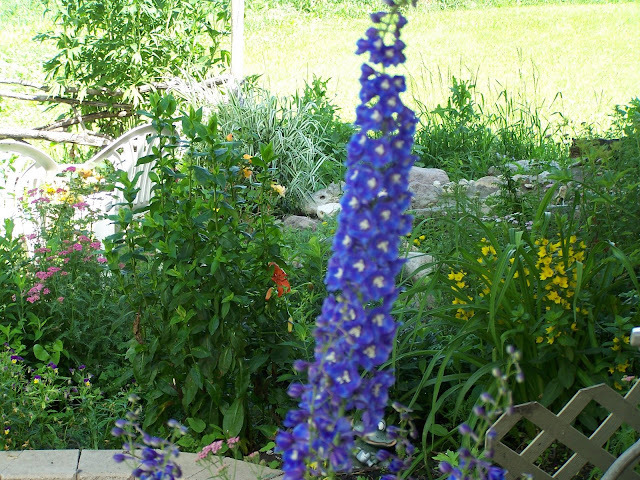 I've never grown delphiniums, (not sure they do well here) but I really like the way they look, and also the color. Thanks Jean...I thought it was loosetrife, but wasn't sure enough to name it! We aren't supposed to grow the purple loosetrife here, but the yellow must be different. It's so pretty, I wouldn't mind it spreading! Oh how beautiful! I loved all your photos today. 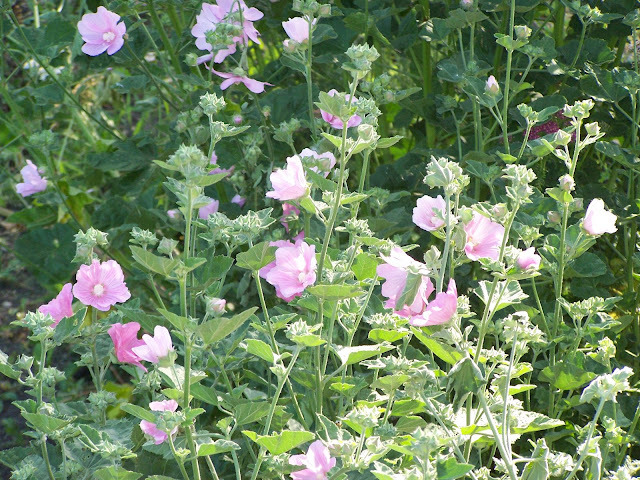 I think my favorite today is the Lavatera. I'm not sure we have it here (Colorado), but if we do it's not common. It's simply beautiful! My favorite is the Delphinium- just beautiful! You have a lovely paradise there outside your deck! 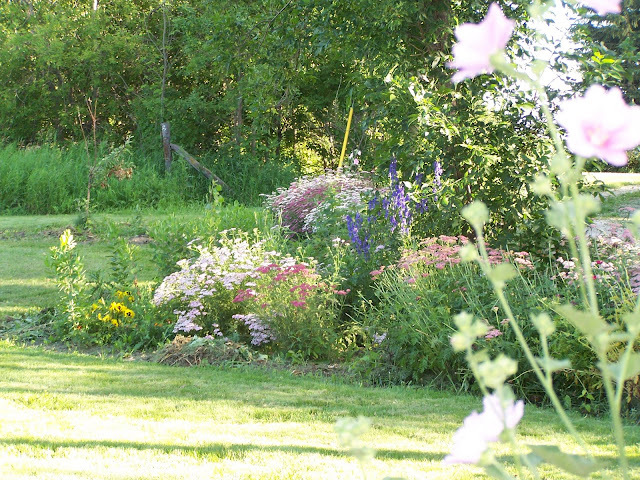 Your garden is looking lovely. I love the delphinium, they don't seem to do well here. Looks like you've been busy with the weeding. It is hard to keep up sometimes. 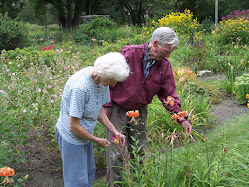 I always enjoy visiting your blog and looking at all your lovely things in your garden! lovely things in your garden!